Captured! By Robots, just home momentarily from a National two-month spring tour will be hitting the road again in June 2005 for a long over due tour of Canada with limited dates in the US. The “Greatest Hits” set will feature songs from both “The Ten Commandments and Get Fit with…” along with songs from Captured! Alive. These summer dates will be the only time in the foreseeable future to catch these songs again live. Captured! 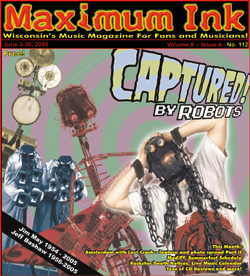 By Robots recently recorded the follow up to the DVD/CD release “Captured! Alive.” This new release is a double CD entitled “The Ten Commandments / Get Fit with…” This release was recorded in the studio and contains two bonus 10 minute MPEGs – one clip from each of the past two tours, both filmed at the Green Door in Oklahoma City OK. “The Ten Commandments / Get Fit with…” chronicles the past two themed tours, The Ten Commandments CD was the set performed on the 2003 Fall Tour, and the Get Fit with…. CD is the set from the most recent 2004 Fall tour. Each CD will feature ten of Jbot’s favorite songs from each set. Due to acts of God, ie: manufacturing issues the release due out in April 2005, has not been available on tour or in stores but is now available. Captured! By Robots will be appearing at the Annex in Madison with Droids Attack on June 13th and will tour the US and Canada again in the Fall of 2005 with a brand new set of music.